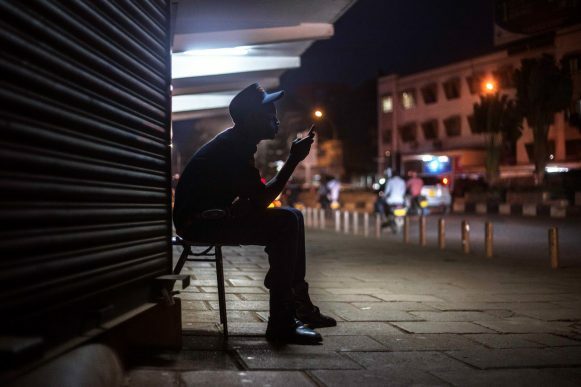 It is with great delight that we announced the winners of the 6th edition of the Uganda Press Photo Award(UPPA) and the 2nd Young Photographer Award: Timothy Latim and Stuart Tibaweswa respectively. 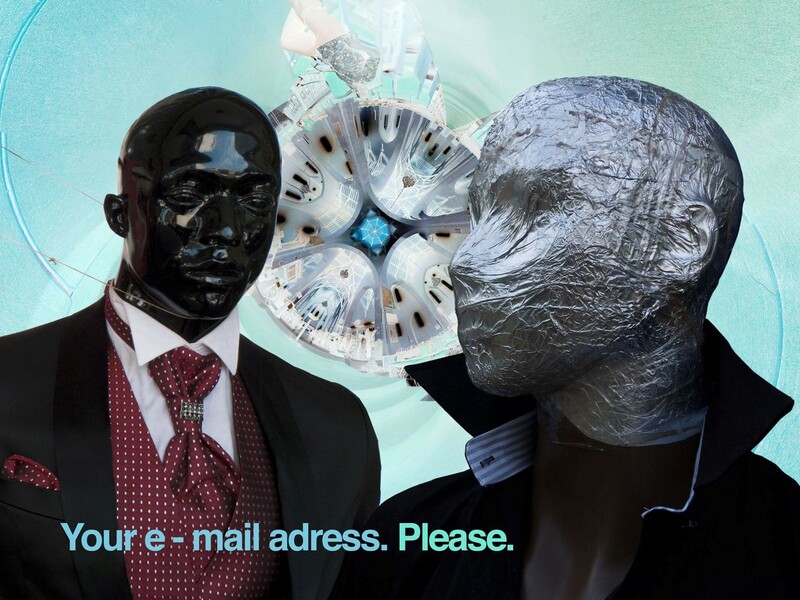 The 6th edition of the Uganda Press Photo Award welcomed a number of changes the most significant being the welcoming of 3 new judges; Edward Echwalu, Mulugeta Ayene and Yasuyoshi Chiba who joined Annette Sebba, Katrin Peters-Klaphake and Neo Ntsoma onto the panel as Jide Adeniyi-Jones, Carl de Souza and Frederic Noy were unable to join this year. Timothy Latim takes home a Canon EOS 7D Mark II DSLR camera kit and a backpack, both sponsored by Canon, to support his future work and career; a chance to participate in next year’s mentorship programme, along with the winner of the 2nd edition of the Young Photographer Award should they so wish. The outcome of that mentorship will lead to a chance at a solo exhibition next year. The Young Photographer Award is purely developmental and Stuart Tibaweswa as winner gets a Canon EOS 1300D camera kit which will be used during the mentorship programme. The judges for this competition included Katrin Peters-Klaphake, Jiro Ose, Anne Ackermann, Georgina Goodwin and Martin Kharumwa. 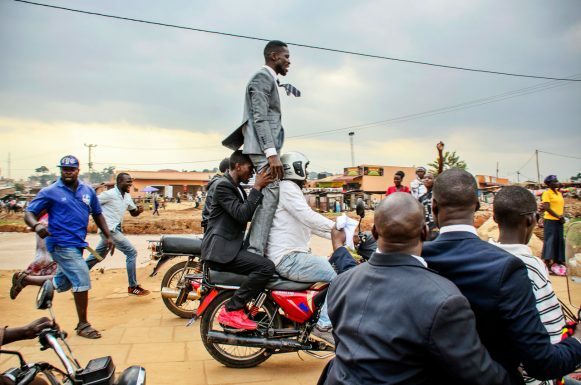 The Uganda Press Photo Award (UPPA) started in 2012 and is supported by the Friedrich Ebert-Stiftung Uganda, Canon Central and North Africa (CCNA) and the Foreign Correspondents’ Association of Uganda (FCAU). The Embassy of the Kingdom of the Netherlands, the Embassy of the Federal Republic of Germany, Feature Story News and Definition Africa. The winners were announced at an awards ceremony held at The Square on Thursday, October 26, and the winners’ exhibition was launched at the same occasion. The exhibition is now open to the public, free of charge, at the Square and runs until November 26. The visitors can also enjoy “This Time We Are Young” a documentary project about Ugandan youth developed by Esther Mbabazi, the winner of the Young Photographer Award in 2016 as well as “InQuest For”, a travelling exhibition from Ethiopia featuring the work of six emerging photographers from Addis Ababa: Abel Assefa, Brook Getachew, Eyoeal Kefyalew, Meseret Argaw, Maheder Hailesellassie and Zelalem Gizachew; and curated by one of our sitting judges Katrin Peters-Klaphake. Katumba Badru, 1st Place, News. From Ghetto to Parliament Pop star and self-proclaimed ‘Ghetto President’ Robert Kyagulanyi a.k.a. Bobi Wine celebrates after winning a seat in Uganda’s Parliament following a contentious by-election race in Kyadondo East. Despite a campaign marred by heavy-handed police tactics against his supporters, the charismatic reggae singer carried the vote with a strong majority, shocking the establishment with his transformation from brash, deadlocked youth to sharp-suited and savvy political operator. Zahara Abdul, 1st Place, Daily Life. Night Shift. A security guard scrolls through his phone ahead of a long night’s work. 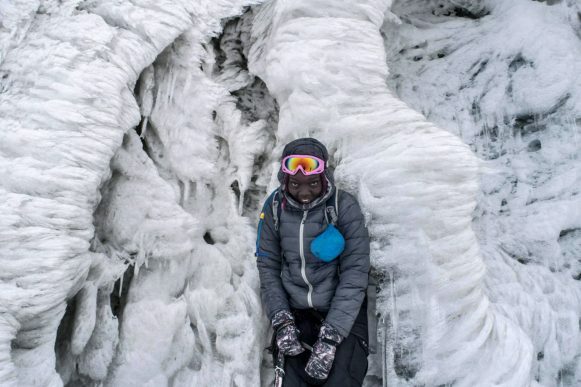 Timothy Latim, Overall Winner, 1st Place, Portrait Summiting Margherita A climber pauses to pose for a portrait in front of a wall of ice near the summit of Margherita Peak, the highest of the Rwenzori mountain range. The glacier which covers the peaks of these mountains is receding year by year as a result of climate change, and will disappear in the future. Alongside the many international climbers who come to visit and conquer this challenging environment, there are an increasing number of local tourists climbing the peaks and discovering the beauty of the unique landscape and ecosystem. Katumba Badru, 1st Place, Sport. 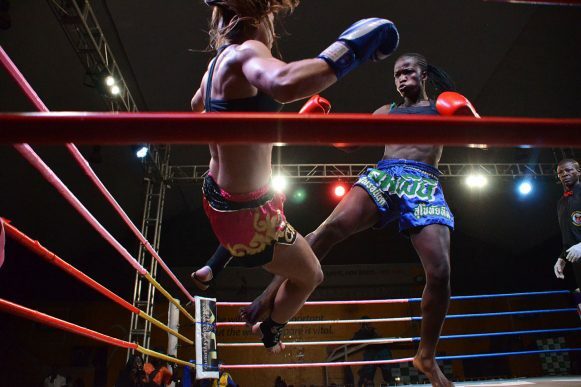 Reign of Giants Uganda’s top female kick-boxer, Patricia Apolot continued her dominance in the ring with yet another wonderful display as she defended her intercontinental title for the 3rd time in a row on May 14th 2017. In a fight dubbed the Reign of Giants, Apolot managed to defeat Austria’s Carina Greimel at the MTN Arena in Lugogo. Popularly known as the “Black Pearl”, Apolot was crowned the winner in the 4th round with a victory on points. The 26-year-old fighter has continued to rise in prominence with every passing event. Musiime Muramura, 1st Place, Nature. Giraffe Translocation The Uganda Wildlife Authority, with assistance from the Giraffe Conservation Fund, has begun to translocate giraffes from the north of Murchison Falls National Park, where their population has been increasing, to other areas of Uganda where they are extinct or have not been seen in living memory. 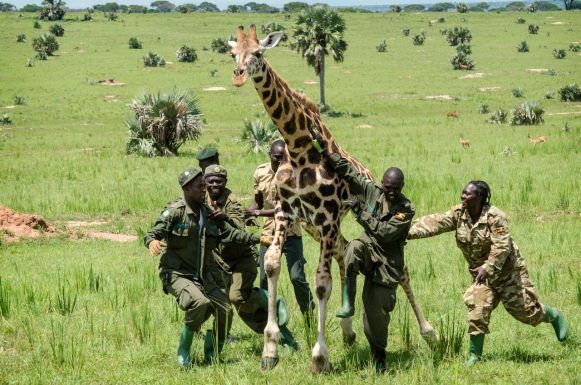 The gallant staff of the Uganda Wildlife Authority are instrumental in the capture and translocation process, as pictured here as they attempt to restrain a darted giraffe. Gilbert Yoti, 1st Place, Creative. 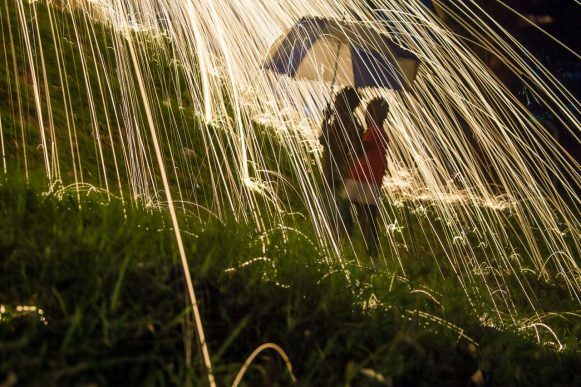 Fire Rain Friends Milton (7) and Sofia (6) shelter from a shower of sparks by hiding under a broken umbrella as they climb up a grassy slope. Being afraid, Sofia holds onto Milton’s shoulders from the back and lets him to lead the way up. Timothy Latim, 1st Place, Story. On the top of the world Mountaineering in the Rwenzori mountains is mostly rock, bogs, cold, rain and sunshine. Summiting Margherita is mostly ice, rock and sweat. 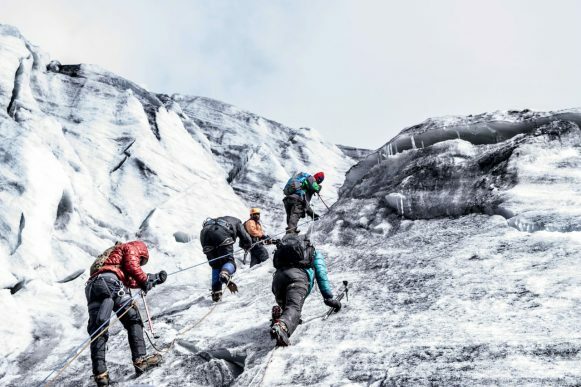 Fewer summits in Uganda offer a better reward-based challenge than Margherita, but it may not be the same challenge in 50 years, because every year the glacier line recedes as a result of climate change. As temperatures rise, the Rwenzori’s tropical glaciers- located as high as 16,500 feet- are fast disappearing. Anna Kucma is a Kampala-based independent Polish curator, writer, and art project manager. While working in one of Kampala’s more prominent contemporary art galleries, she developed a strong interest in photography, which led her to start the Uganda Press Photo Award (UPPA), a platform for Ugandan photographers to share their experiences, learn new skills, and exhibit their work to a wider public.